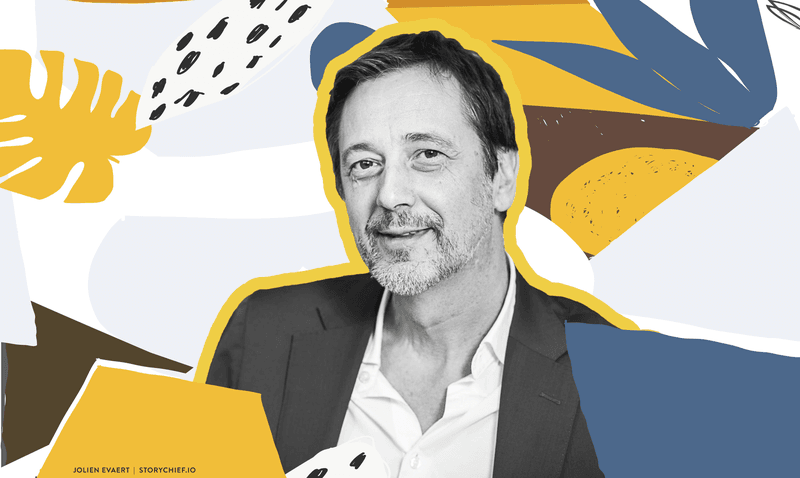 Like any decent interviewer does, I used my network of people and search engines alike, to get a sit-down earlier this month with Rik Vera of Nexxworks. Nexxworks is a believer in content marketing in this age of digital transformation and innovation. I have to admit that it felt like less of an interview, and more like a conversation between two old friends. Tell me about your book, Rik. Managers The Day After Tomorrow. It's being translated into English. I did catch a sneak preview of its prologue it on your personal website. Yes. It will be out in English on the 18th of September (Update: The book is now available in English). I have to say. I was used to writing columns and blogs but writing a book is so different. When you write for Belgian newspapers, let's say, you hit a limit of 800 words max. so you get used to that kind of writing, versus chapters of 5,000 words. I wrote it myself in Dutch, and I'm thrilled with the the translation because translations often make or break a book. I wanted to write a book that I would like to read. Which world do you live in? So then I have to ask, are you a fan of the television series Stranger Things? The whole premise is based upon the idea the idea of the "Upside Down—some an alternate dimension existing in parallel to the human world? Yes. That was the purpose of my cover photo. This is about what is really happening. You have this upper world and this underworld and when you look at business, most companies are still living in the upper world. And they don't realize that beneath them there's a whole new world developing. And all of a sudden the underworld has become the upper world and vice versa. "For most companies, the day after tomorrow is already here." Now if we look at retail it's already happened. They don't realize that they've become the underworld because the consumers have discovered the new world and switched over. In the end, these businesses are left with their old business models but no customers anymore. "There's a new economy that looks like the old one, like Airbnb still looks like a hotel business the same way Uber still looks like a taxi business." But this is the upper world and underworld we're talking about. Some of these business leaders are looking right in the mirror and can't understand how the image looks the same, but one business model is successful and theirs isn't. That's because on one side of the mirror there is a different set of physical laws than on the other side. Physics? It was one of the harder subjects I tackled in school. Tell me more about how physics plays into this wave of digital transformation. The laws of physics of the old economy and the new economy are totally different. As long as people are unwilling to unlearn the old ways, they won't learn the new physics involved and they'll never learn the new ways. But you don't have to change your building blocks. Just realize that the connections we've made between the blocks in the old economy, are made by the old laws of physics and with the new set of laws of physics, there's a different structure between the connections. 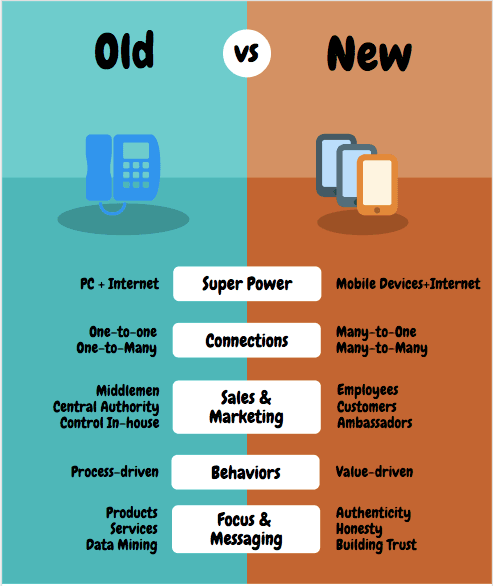 Connections between companies and people, people and their companies, are different now. And companies stuck in the old normal think it's enough to just "digitize" the old structure, instead of decomposing and recomposing the connections using the new physics. I hope everyone comes to understand the new physics. Amen to that. So can we talk specifically about how sales and marketing has changed? We've had more than 100 years of interaction in society between companies and customers that was based on companies having some one-to-one between the sales rep and consumer. Maybe it was someone in your shop talking to a customer, or even in business-to-business. Then there was the one-to-many marketing. Because back then, that was all you could do. So we'd developed a whole set of rules and concepts, management techniques, and marketing techniques to fit that type of world. Consumers were given super powers at some point, through the gifts of PCs and internet. Not only did they have information at their fingertips but access to each other as well. "For the first time in history we are all connected." All of a sudden, it's about many-to-one. The "many" companies are now fighting for the attention of that "one" customer. This is your axis to the whole world. It's not just about PCs anymore but about smartphones and other mobile devices. This is now the customer's super power. Companies have long thought that this was their super power, but actually it's the customer's. Many companies underestimate that this gives the people the power to be connected to everyone else. It puts customers in the center of the universe. So, the one-to-one and one-to-many has flipped over to many-to-one and many-to-many. Yes. We've evolved to a society where there is no more middleman and no central authority. Everybody's connected to everybody so if you look at classical marketing, there was segmentation and buyers' personas. We'd even developed customer journeys and all those attempts to get closer to the customer. Customers want to be treated like an individual at any given time and at any given moment. The many-to-one and many-to-many is the new physics and I compare it with the layers of your brain. It's not that the lower layers don't exist anymore just because there will still be need for the one-to-one and one-to-many but it's just got different laws of physics because of the layers on top of them. The new successful companies will maximize on the new physics by using their customers to become their sales and marketing departments, this includes content marketing. Customers can become your infrastructure. Those who didn't believe at first in Airbnb and Uber thought it was unmanageable. They believed you needed to have control of the properties being rented and of the cars being driven. They underestimated the power of the network in which people can control the quality, and can even be the infrastructure to provide you with the product. These same customers can also destroy you. We've seen it happen. And so you need to in tune at all times, because companies can be killed overnight. It's no longer companies that control it but the tribes of people who do. You need to humble enough as a company to be in tune with the tribes out there. So how do you do that? How do you show humility? Dive into your red ocean of frustrated customers and engage them to create an eco-system. Use your customer data to show them you care and that you know them, not merely to up-sell or cross sell or deep sell. Don't go around shouting that you have the best product, but show that you're authentic and trustworthy. This is quite similar to what I've been hearing from industry experts in many fields, that authenticity and building trust are taking back their rightful place on the business throne. Yes. Building trust, being honest and ethical, and showing that you care—that you have a heart. "Show who you are because people want to work with people who have a personality." Customer centricity doesn't mean you yourself don't have a personality. Nobody likes to do business with those with no personality. Make sure you're putting people between you and your customer and empowering them. Take your people out of processes and show them the values of your company. Show your heart and your personality on the outside and the inside so that your people engage in value-driven behavior and not process-driven behavior. So then I can assume that you're a believer in employee-driven and customer-driven content marketing? Collaboration in content creation? The more external or non-middleman stories being written about the company, the more attractive the companies become. This is something that companies still have to get used to. They haven't been trained like that and now all of a sudden, they have to give up that central power and give up some of their content marketing to someone else they may never have even met in person. That requires a new kind of leadership. And is that how you, and the management team, lead here at Nexxworks? And how do you think it compares to the bigger and older companies out there? Even a company like ours is at at tipping point between old society and new society—old ways of leading a company and new ways. It's pretty easy for us because we're a small and young company, but I do recognize that it's awfully difficult for bigger companies to go through that process. And then you get conflicts of interest. They ask the people who are closest to the customers to become more customer centric, but then halfway through the process they revert back to the old way. Then you have a lawyer of people between the old company and where the company wants to be. "We're burning a whole set of bright younger managers that are stuck in the middle." Is this why you wrote your book? Because I know your partners Peter Hinssen and Steven Van Belleghem also wrote their own take on the changes you speak of. 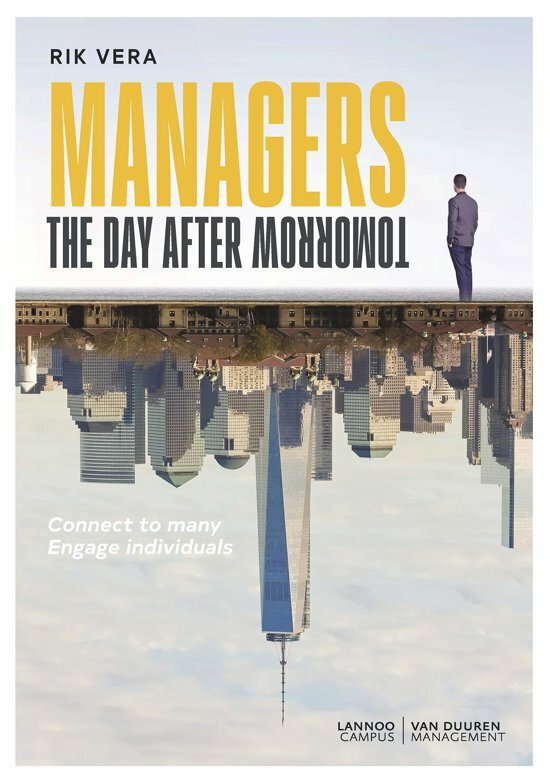 But your book is specifically targeted at managers. Yes. Managers are the people I know best given my background. The managers. How do you tackle those challenges? The book isn't some some silver bullet but I wanted to make sure that the managers of today are aware of the physics of that new world and its vision. You also do this through your blog at Nexxworks. You all obviously believe in content marketing as a marketing tool. Can we talk about content marketing? Its past, present and future? Content marketing is going to be the new science and once it becomes a science you'll be able to automate it. SEO can be automated. Authenticity maybe even be able to be automated, but I'm a strong believer that beauty is in the imperfections. We have to be careful about things being too perfect. I don't like to read articles where you sense there's a hidden agenda. I like to read something and sense that this is written for the content and not content that's written to appeal to a certain public. But that's just me. Amen. Same here. But what about this idea that content marketing will soon be directed at you by AI? Parts of what we do will be driven by AI—no question about that. AI will be able to write the stories but in the meanwhile it's all about authenticity. I hate it when companies make up stories. "Don't make up stories and try to create authenticity. It has a boomerang effect and will come back and hit you in the face"
It's about content and no longer all about your products and your services. Because of this shift in marketing you see everyone turning off pop-ups and ignoring ads. But now the ads are being worked into content. I struggle with this myself but I know that it's a necessary evil in content marketing. I'm struggling with the same thing here. We're all about content-content-content marketing. But how far can you go in call-to-action (CTA) without losing your authenticity? We used to produce content and believe it was enough. It's not. If you have products to sell. As long as it's organic, you don't need sales and content can be enough. But as soon as you start scaling up then it's another story. You can't pay people with content. There's a very thin line. Those who specialize in helping out companies find that right balance of being commercial and authentic in their content marketing—they'll be major players and of major importance. Agreed. That's a special role needing to be filled and those reading this, particularly those looking for career advice would be wise to pursue that. Now, in closing, I'd like to get a little personal. Your daughters, they're well into their 20s. But let's say, they've just graduated high school and you could give them one piece of advice on setting out on a career path. Udacity. Take advantage that there's something like this available. Conventional institutions for higher education are great, but in this day and age you'd be silly not to gain the skills needed for the day after tomorrow. Story Chief thanks Rik for being so very generous with his time. Founding Teams: Is the team complete? Do you have a Hacker and a Hipster and a Hustler?